I've just completed a series of enhancements to the Now Showing - All Movies page that are worthy of noting. In a follow-up to a similar addition to the Coming Soon page, the top 10 favorite movies currently playing in theaters are now shown on the right side of the All Movies listing. This list is generated daily from all the movies that our readers have marked as their Favorite Movies. The Favorite Movies feature allows you to pick out certain movies that you're most interested in, and those will be highlighted on your personal "Your Favorite Movies" page when you visit the Now Showing section. This display now provides you with a way to see what other BigScreen readers have marked as their favorite movies, which may be worth checking out yourself! If you haven't marked any movies as your Favorites yet, you can do so from the Information page for any movie. Just click on the "Add to Favorites" link beneath the "Are You Planning to See This Movie?" heading! The movie listings on the All Movies page has been enhanced with category headings when you choose to sort by Release Date, MPAA Rating, and Genre. When there are 70+ movies from which to choose, looking at a simple list of all of them can make it difficult to find one particular movie of interest. With these new category headings, the movies are broken into groups that make sense for the type of sort that you chose. The above change also made the "MPAA Rating" and "Genre" pages in Now Showing redundant, as the corresponding sort options on the All Movies page now show the same content. 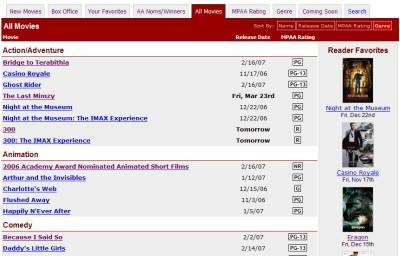 To keep the choices simple in the Now Showing section, those two tabs will be removed in the near future. For the time being, I have placed a notice at the top of the page when you choose one of the deprecated tabs. Removing these tabs will allow us to add other tabs which make sense to break out into separate features. If you have some ideas for what could be added, please feel free to submit them via our Feedback Form!